Your mobile site’s load speed has a significant effect on your site visitors’ experience, and you can’t optimize your desktop site speed and call it a day. If your mobile site is taking more than 3 seconds to load, you need to do something about it. Statistics show that 53% of mobile users leave a site that takes too long to load. A delay by just one second in page load time can reduce conversions by up to 7%, according to a report on Fast Company. Your mobile site’s speed is increasingly becoming important, especially after Google released the Speed Update in July 2018 that made mobile page speed a direct ranking factor. As mentioned in the first sentence of this guide, you can’t optimize your desktop site speed and expect that your mobile site speed will follow. Take a look at the picture below to understand how mobile fits into your site and visitor strategies to see where your focus needs to be. 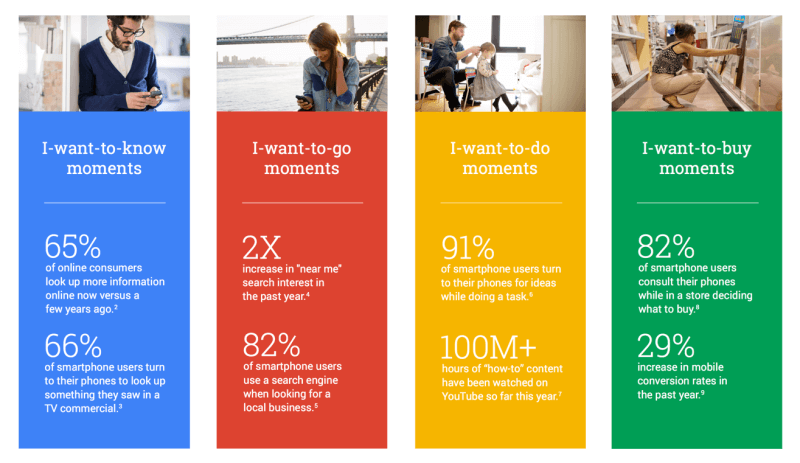 Speed is a major concern for users who are in "I want to" moments. They're looking for answers quickly and without delay. The fact that 91% of smartphone users turn to their phone for ideas while doing a task just shows you that your visitors' attention spans are short. How fast is fast when it comes to mobile speed? 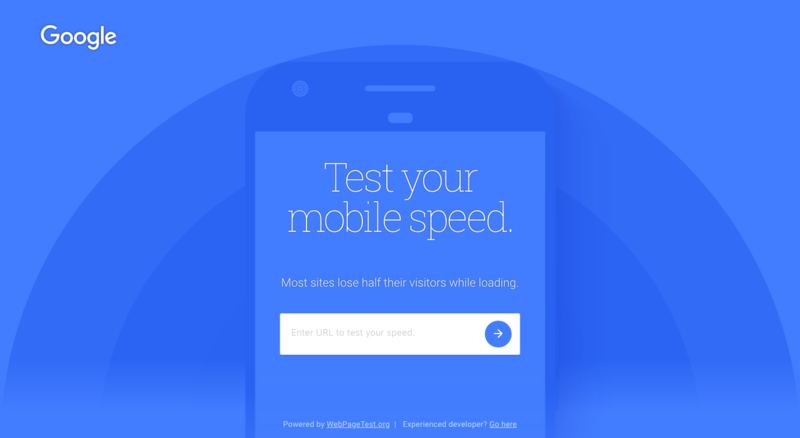 So just how fast should your mobile site speed be? Google’s site speed checker can analyze your mobile site speed by using a standard 3G connection (70% of mobile network connections globally will occur at 3G or slower speeds through 2020). You can also test your site yourself using Google Chrome "Inspect Element". Choose from mid-tier or low-end mobile devices to see how long it takes for your site to load. 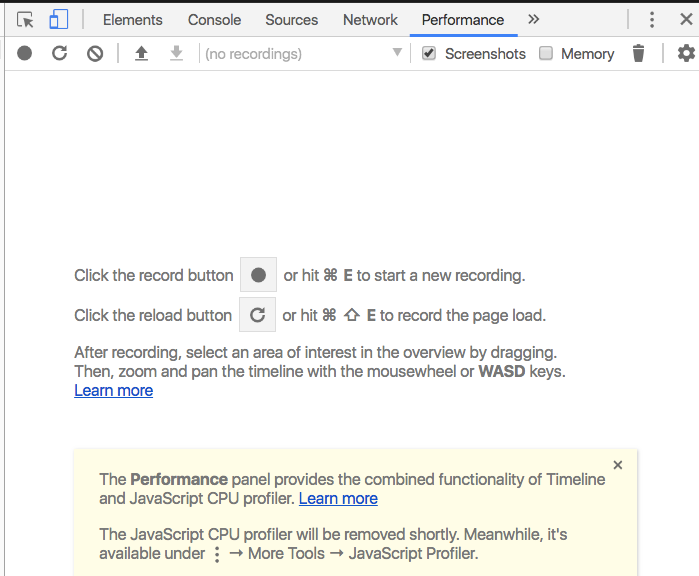 You can also record your page load time by clicking on “Performance”. Most tricks to increase your site’s load speed will be covered in our page load time guide and will improve your site’s speed on any device. Here are a few others that will be particularly effective in increasing your mobile page speed. Content that your site user will see first should be given priority over content that they are likely to see later. Therefore, content at the top of the page should load before content at the bottom of the page. This way, users will not be inconvenienced even if the page has not completely loaded. They might not even notice that part of the page is not loaded when they first land on a page. Server response time is the time taken by your server to respond to a request from a browser. Google recommends that your server response time should not be more than 200 milliseconds. You can minimize your server response time by improving your server’s software and configuration. You should avoid redirects as much as possible as they reduce a page’s load speed, especially for mobile users as they are often using less reliable internet connections than desktop users. An Accelerated Mobile Page (AMP) is an HTML page that is very lightweight and therefore loads faster than a typical HTML page. A couple of elements of a basic HTML page such as forms are excluded from an AMP. Only the elements that are suitable for mobile users are loaded. Images and other media do not load until they are in view. This is what makes AMPs so much faster than regular HTML pages. AMPs are supported by several platforms and are compatible with different browsers. Using AMPs can reduce the time your mobile site takes to load by up to 85%. Some sites that are already using AMPs include The Guardian, Gizmodo, and The Washington Post. The weight of the page and the user’s quality of internet connection significantly reduce a page’s loading time. To reduce the weight of the page, try to have as little information as possible on the page. However, you should be careful not to compromise on the relevance and quality of the information on the page in an attempt to minimize the amount of information. With light pages, even a user on a poor internet connection will be able to use your mobile site without much trouble. Light pages also make it easier for a user to scroll through the pages. Weighty pages may present the challenge of scroll lag which can be very frustrating. Your site should be able to detect the type of device that is being used to access it and tailor the experience to suit the device. It should also be able to detect a poor internet connection and only load the information that is absolutely necessary. Googe's Speed Update only affected pages with very slow loading speeds. This means that webmasters have to up their game when it comes to improving the speed of their mobile sites. A mobile site with slow loading times will find itself left behind by Google.